Liz Did It: Well Hello Mellow Yellow! I remember an episode of Oprah a few years back where the incomparable Nate Berkus decorated an entire bedroom using only items from Walmart. I am not quite that brave, but I did create another “dream room” using only items from the glorious Target (read: Tar-gét). 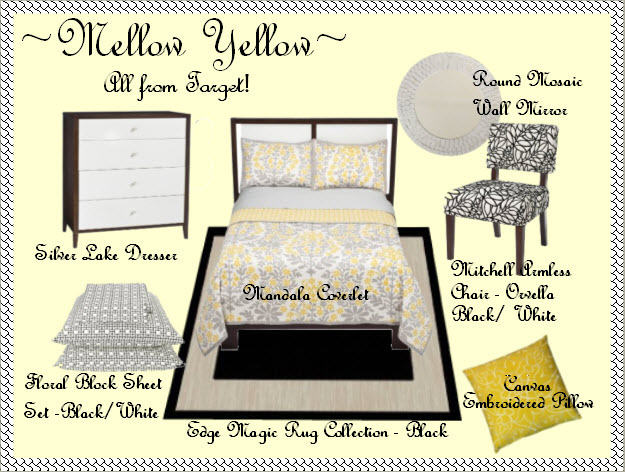 During such a gloomy New England week I needed to create my own dose of Sunshine, so here is my lemony sunshiney and affordable Mellow Yellow dream room.